That’s right. I admit it. I’ve been bitten by the Twilight vampire book series, by Stephenie Meyer, and I’m 52 years old. The movies first caught my attention when my co-workers went to see them in packs when they came to nearby theaters. No rush for me though. I eventually rented Twilight, prepared myself for an average movie, and I’m happy to say, that five minutes into the movie, I was hooked. It was fast-paced, realistic, set in an interesting location, and had a wonderfully agonizing love story at its core. I don’t care how old you are; the old “boy and girl love each other but can’t quite have each other” story line always works, especially if the boy rescues the girl at unexpected times. So there I was, hooked on the movies. I eagerly rented New Moon, and actually went to the theater finally to see Eclipse, and then watched New Moon and Twilight a few more times as well. A guilty pleasure to be sure. Then summer was here and I had time on my hands. 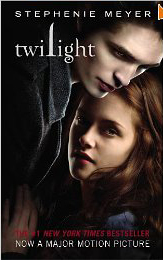 The Twilight saga books seemed the perfect way to read my way through the summer in the little town of Forks with Bella, Edward and the gang. I headed to the bookstore and was dumbfounded when I couldn’t find the books. I finally asked for help, and was embarrassed when I was told they were in the “Young Adult Section.” I bought them anyway, and began reading the stories from the beginning to see what all the fuss was about. I’m happy to report that I can now admit I enjoyed the books even though they were supposedly for “young adult readers.” I’m not sure what puts a book in that category, but I did find them easier to read. That was fine with me. They were still interesting and quite the page-turners, and it was actually nice to not have to think too hard when doing some recreational reading. After reading the first two books, I watched the movies again to see how they translated the scenes in the book to the movies, and found even that was interesting. In the books, for example, you find out more about Bella. She has a job, cooks for Charlie, and is hopelessly clumsy, but not so in the movies. The books actually were guilty of dragging out some scenes and having excess dialogue, but I’m not complaining. I was more than happy to lengthen my stay in the “Twilight” world. I’m hoping to see the movie of the final story, Breaking Dawn, before I read the book, but I may not be able to wait that long. Vampires, werewolves, schoolgirls in danger, and a wicked love triangle…how will it all end? This entry was posted in Articles, Book Store and tagged Bella, breaking dawn, Edward, love, romance, twilight, vampires, wolves on October 18, 2010 by Kathy.